Great participatory journalism exploring the world of modern mindfulness and meditation. If you’re skeptical of the benefits of meditation, especially if you think it’s “too spiritual” or “woo-woo” for you, I highly recommend reading this. What’s the point of meditation? 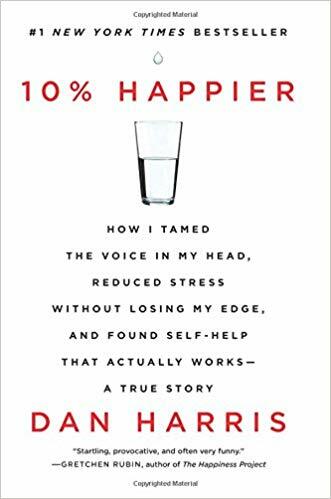 According to Dan, it makes you “10% happier,” and like any skill, it’s something that can developed through practice. It quiets the voices in your head, makes you appreciate the present more, decreases your anxiety over the past and future, and makes you a better person. The ego is constantly comparing itself to others. It has us measuring our self-worth against the looks, wealth, and social status of everyone else. Perhaps the most powerful Tollean insight into the ego was that it is obsessed with the past and the future, at the expense of the present. We “live almost exclusively through memory and anticipation,” he wrote. We wax nostalgic for prior events during which we were doubtless ruminating or projecting. We cast forward to future events during which we will certainly be fantasizing. But as Tolle pointed out, it is, quite literally, always Now. This, as Joseph had pointed out on retreat, is the lie we tell ourselves our whole lives: as soon as we get the next meal, party, vacation, sexual encounter, as soon as we get married, get a promotion, get to the airport check-in, get through security and consume a bouquet of Auntie Anne’s Cinnamon Sugar Stix, we’ll feel really good. We live so much of our lives pushed forward by these “if only” thoughts, and yet the itch remains. The pursuit of happiness becomes the source of our unhappiness.